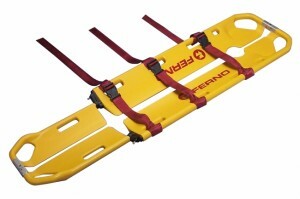 A scoop stretcher is used to recover patients from the field and transfer them to a more sophisticated stretcher on the aircraft. Two blades are slid underneath the patient and then joined at the head and the foot end. It enables a safe transfer for those patients with injuries that require very careful handling for example, those with spinal injuries. Copyrights © Ozevac Aeromedical Retrieval Specialists 1985-2019. All rights reserved.